Following completion of her Bsc (Hons) Physiology and Sports Science degree at the University of Glasgow, Scotland, Claire Perras enjoyed working in the world of athlete development. Her career opened her eyes as to how we could positively effect our equine athletes performance by mirroring the services we offer to our human athletes. Claire has since trained and studied as an Equinology Equine Body Worker Level II (EEBW II), and strives to emulate the support provided for our human athletes, to our equine friends. Equinology is a very well established and respected education provider for the equine & canine health care industry. It sets itself apart from other providers with its high profile instructors, international courses and a system of monitored externships. These externships allow students to develop their skills over time to produce high calibre graduates that can provide a quality service. Please go to their website to find out more about the many organizations that recognise and support this programme. Claire is always striving to find alternatives ways to provide a varied and equine specific session. In doing so she is constantly taking new courses and shadowing local professionals. Watch this space for her new and exciting qualifications…..
Claire has ridden in Scotland from a very young age. Horses took a back seat in her later teenage years in order for her to compete for Scotland in Curling. After having 2 children and spending some time time living in Lima, Peru, her family then moved to Calgary, Canada where she could revisit her first love – horses! 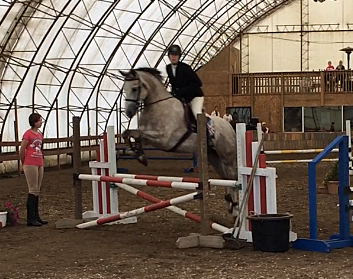 There she trained in equine therapy and competed in show jumping and eventing (Huska-Berg Farms) with her horse Flint. Her family (Flint too!) recently had the opportunity to return to Scotland, where she is now able to provide a service to clients in the Aberdeenshire area! Keep an eye on her facebook page for updates on their adventures. Equinology Equine Body Worker (EEBW) – Instructor feedback: “It was a joy to watch this massage. Great job! I certainly would have you work on a horse of mine.” Ruth Mitchell-Golladay PT, MT, NCTMB, EEBW. Course plus 6 month externship completed and passed. Calgary, Canada. 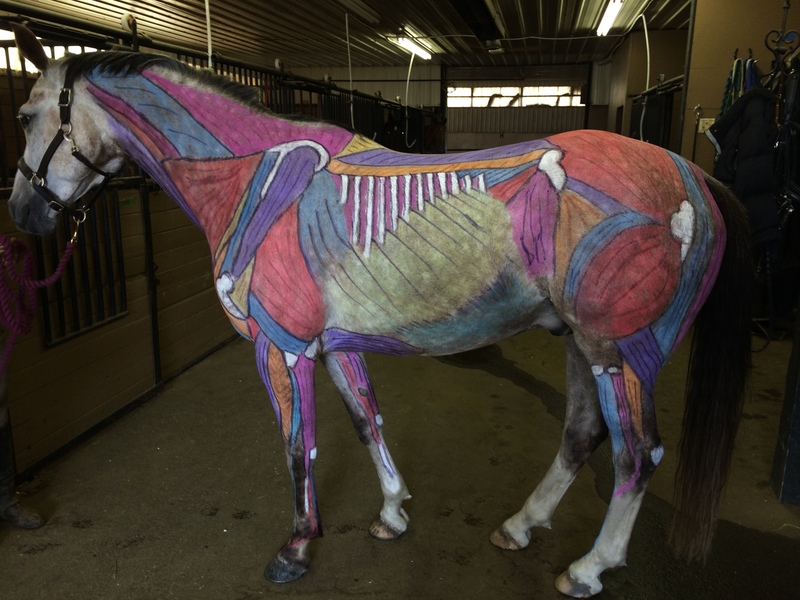 Equinology Anatomy Discovery Workshop; An in depth equine anatomy course that builds each muscle in clay onto a model skeleton. 4 month externship completed and passed. Calgary, Canada. Equine Myofascial Release (Level 1); A fantastic course taught by Ruth Mitchell-Golladay. Participants are tained in the theory, concepts and practice of Myofascial Release (MFR) as it pertains to the equine population. MFR restores the length and elasticity of the fascia creating long term benefits. Please see MFR for more information. 4 month externship completed and passed. Calgary, Canada. Equine Exercise Physiology (module); University of Guelf, Ontario – completed with 91%, A+ grade.